An number of readers responded to the post (here) on growth in US monetary base with "so what?" 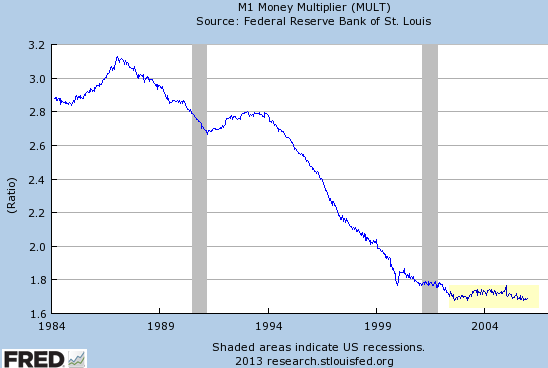 After all the so-called "money multiplier" has been at historical lows - meaning that the Fed's monetary expansion has not made its way into the broader economy. The argument is that all this new liquidity is "trapped" in bank reserves, as lending remains tepid. According to this traditional school of thought, you need sharp growth in the broader money supply to generate inflation - a major threat to the economy. But there is a problem with this argument. Greenspan's Fed also believed that as long as the money multiplier was at historical lows, loose monetary policy is justified. 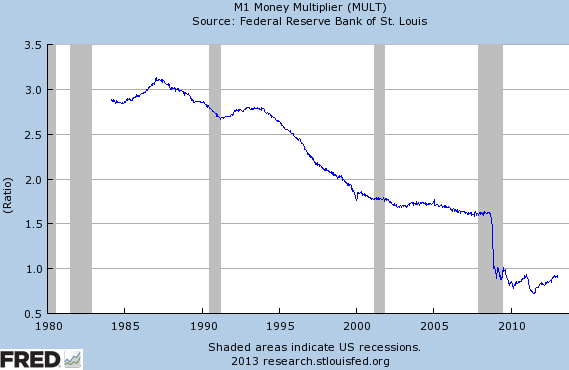 And in 2002-2005 the money multiplier was indeed at historical lows. This is what the trend looked like to economists before the crisis. Inflation of course was not a major issue at the time - at least not by historical standards. And the Fed continued with loose monetary policy, as fed funds target rate hit 1% during 2003-2004. The fed began to raise rates in the second half of the decade, but by that time it was too late. Rate increases ultimately served to burst the housing bubble in 2006. What many economists failed to realize - and many continue to do so today - was that the risk of excessive liquidity is not necessarily the overall price inflation. With US wages stagnant, those looking for a 70s-style inflation will not find it. Instead liquidity manifests itself in asset bubbles, which is exactly what was happening in the housing market at the time when the money multiplier was at the lowest levels in recent history (chart above). Plus in a global economy, inflation (including wage inflation) was simply exported to emerging markets nations. Economists and market participants however find ways of rationalizing asset bubbles - just as they did with the housing market in the US and China's double digit growth (among other bubbles) during the first half of last decade. That's why using the traditional money multiplier as a rationale for an ultra loose monetary policy is not prudent. 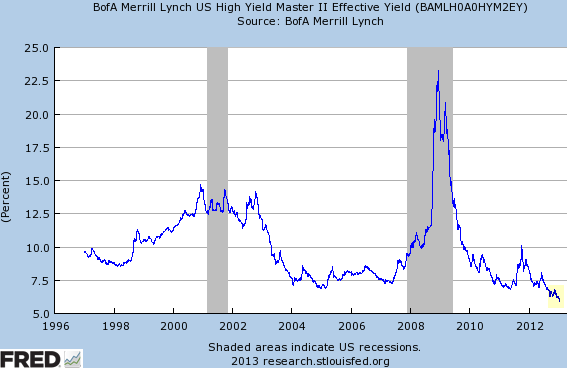 As an example of where this excess liquidity may be ending up today, consider the fact that the average US corporate junk bond yield ended up at an all-time low of 5.93 last week (chart below). Of course market participants have dozens of ways of rationalizing this trend - just as they did with other markets many times before. Therefore before dismissing the expansion in the US monetary base as inconsequential, consider the fact that in spite of low money multiplier, excess liquidity will find ways to distort markets right under our noses. And you don't need to generate headline inflation in order for these distortions to damage the economy when the correction finally takes place.